San Rafael bikes are designed and built for active recreational riders. 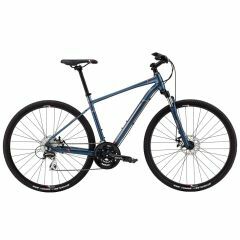 These models offer lightweight Series 2 and Series 3 6061 aluminum frames, suspension forks, 8 and 9-speed drivetrains, rack and fender mounts, increased tire clearance, and mixed-terrain tires, with disc brakes on some bikes. Design features include sporty dual sport geometry that balances an active pedaling position with an upright seating position.